AirTAC International Group with its headquarter located in Taiwan and established in Taiwan in 1988, is a well-known supplier/manufacture of pneumatic equipments in the world market. 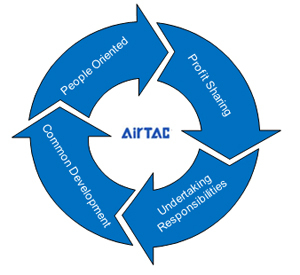 AirTAC is specialized in producing actuators, control components, air preparation products, and accessories, which are widely used in the automotive, machinery manufacturing, metallurgy, electronics, environmental protection, lighting and textile, ceramics, medical equipments, food and packaging automatic industrial fieldes. ●The R&D Center of AirTAC International Group is located in Ningbo, with a building area of 10,527 square meters. ●China Sales Headquarter-AirTAC (China) Co., Ltd, located in Ningbo, with a building area of 33,000 square meters. ●European Sales Headquarter- ATC (Italia) S.R.L. is located in Milan, Italy. ●Southeast Asian Sales Headquarter- AIRTAC INTERNATIONAL (SINGAPORE) PTE. LTD. is located in Singapore. ●AIRTAC INDUSTRIAL (MALAYSIA) SDN. BHD. is located in Johor Bahru, Malaysia. ●AirTAC Co., Ltd. is located in Higashi Osaka-Shi, Osaka, Japan. ●Airtac Industrial Co.,Ltd is located in Bangplee, Samut Prakan, Tailand. ●AIRTAC USA CORPORATION is located in Houston, USA. ●AirTAC comprises three large production bases in Ningbo, Guangdong and Tainan. factories have been put into operation. ●AirTAC Guangdong is located in Nanhai District, Foshan City, with a building area of 34,311 square meters. building area of 103,289 square meters.